Connect to the internet anytime you want. Imagine the ability to connect to the internet anytime you want, anywhere you are. 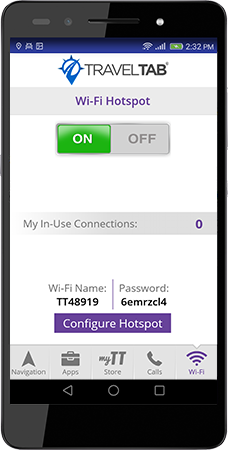 TravelTab places a secure Wi-Fi Hotspot right in your hands, saving you money and giving you fast, reliable and safe access to the web – Wherever you are. It’s even unlimited. Yes, you read that right – Unlimited! Leave crazy-high data overages behind and connect with robust 4G LTE speeds as often as you want. Play games, post your pictures on social media, and do whatever it is that you like doing, all without using your personal phone’s data plan.